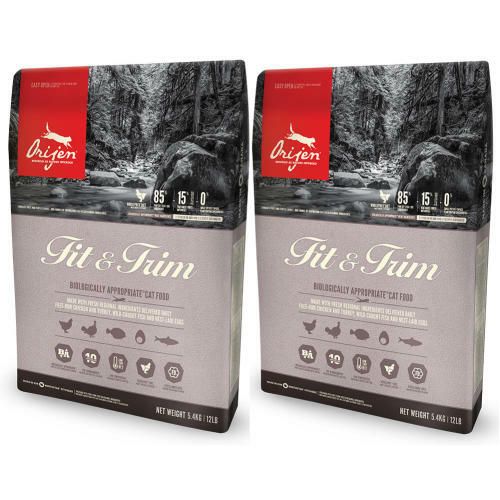 Orijen Fit & Trim Adult Cat Food has been created to help overweight cats lose weight by moderating the fat and carbohydrate content but still providing them with a delicious, protein rich diet. With 44% richly nourishing protein, 15% low-glycemic carbohydrates, and a unique blend of fibres to nourish overweight cats according to their evolutionary and biological needs. Unmatched by any other food, 2/3 of the meats are Fresh (refrigerated, without preservatives) or raw (flash-frozen, without preservatives), including the top 10 meat ingredients. 1/3 of the meats are prepared at 90°C from fresh chicken, turkey and fish to create a concentrated source of richly nourishing protein that cannot be supplied by fresh meats alone. Nutrient-dense WholePrey ratios of fresh meats, organs, and cartilage plus fresh whole fish and fresh whole eggs provide a natural source of virtually every nutrient your cat needs. Infusions of gently freeze-dried liver enhance flavour and palatability naturally, making ORIJEN deliciously tasty, even for selective eaters. Zinc chelate: 100 mg; Copper chelate: 11 mg; Choline chloride: 1200 mg.